Top row: Makaila Caudill, Kerigan Mullins, Alexandria Rakes, Aliyah Rakes, Chloe Gravely, Bailey Watson, Sarah Stevens, Karlynn Goforth, Autumn Vaught. 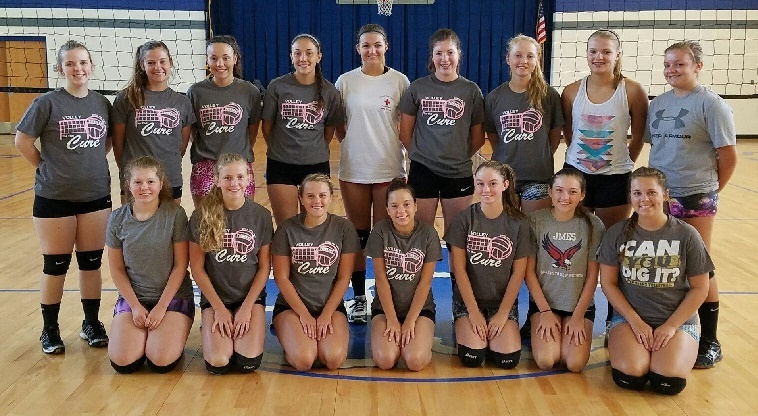 If you have any questions about the camp, you may email the camp director, Coach Houser at coachhouser@yahoo.com, or the camp host, Jessica Watson, and head coach at Fort Chiswell High at Jessica.Watson@Wythek12.org. Coach Moore is the head coach at Patrick County High School. She took over the job in 2006, has been named the Piedmont Coach Of the Year 7 times, has been named Patrick Co. High Coach Of The Year twice, and has a record of 137 wins and only 88 losses. Her team has won the district regular season 3 times, and the tournament 4 times! She has had 11 of her athletes have gone one to play college volleyball. You can contact Coach Moore at Heidi.Moore@patrick.k12.va.us. Touch here to see the FCHS website. See the new location above!